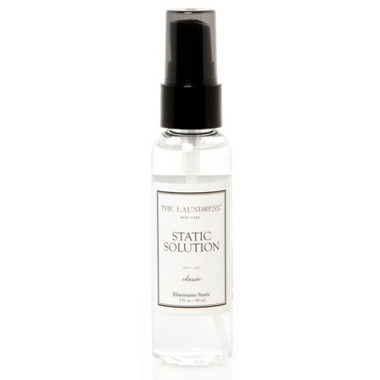 To combat static cling, The Laundress has created this non-aerosol and nontoxic formula that releases static energy while freshening clothing. Since you never know when static will strike, keep a bottle on hand! Directions: Spray on areas of friction from 6" away. Recommended for all fibers and furnishings. Works on hair, too. Ingredients: Deionized water, essential oils and fragrance. Made with nontoxic, biodegradable, and allergen-free materials. Made with natural ingredients. Color and texture may vary. Free of petroleum, SLS, phosphate, phthalates, and dye. Cruelty-free. No animal by-products. All The Laundress products are tested on Gwen & Lindsey, the founders of The Laundress. I use this on my combs and brushes, and I keep one in my purse. It's a temp solution to static and doesn't smell as bad as static guard.